Pyotr Nikolayevich Krasnov (Russian: Пётр Николаевич Краснов; September 22 (September 10 old style), 1869 – January 17, 1947), sometimes referred to in English as Peter Krasnov, was a Don Cossack historian and officer, promoted to Lieutenant General of the Russian army when the revolution broke out in 1917, one of the leaders of the counter-revolutionary White movement afterwards and a Nazi collaborator who mobilized Cossack forces to fight against the Soviet Union during World War II. 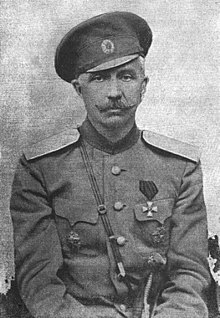 Pyotr Krasnov was born in 1869 in Saint Petersburg, son to lieutenant-general Nikolay Krasnov and grandson to general Ivan Krasnov. In 1888, Krasnov graduated from Pavlovsk Military School and later served in the Ataman regiment of the Life Guards. During World War I, he commanded a Cossack brigade, the 2nd Combined Cossack Division, and in August–October 1917, the 3rd Cavalry Corps. During the October Revolution, Alexander Kerensky appointed Krasnov commander of the army, which was sent to Petrograd from the front to suppress the Bolshevik revolution (see Kerensky-Krasnov uprising). However, Krasnov was defeated and taken prisoner. He was released by the Soviet authorities after falsely promising to end his struggle against the revolution. Krasnov fled to the Don region and in May 1918, in Novocherkassk, was elected Ataman of the Don Cossack Host. With support from Germany, he equipped the army, which would oust the Soviets from the Don region in May–June 1918. By the middle of June, a Don Army was in the field with 40,000 men, 56 guns and 179 machine-guns. In the second half of 1918, Krasnov advanced towards Povorino-Kamyshin-Tsaritsyn, intending to march on Moscow, but was defeated. After Germany's defeat in World War I, he set his sights on the Entente powers in his search for allies. In January 1919, Krasnov was forced to acknowledge General Denikin's authority over the White movement, despite animosity towards him. On February 19, 1919, Krasnov fled to Western Europe after losing the election for the office of Don Ataman. He was succeeded by Afrikan P. Bogaewsky. Arriving first in Germany, he moved to France in 1923, where he continued his anti-Soviet activities. In France Krasnov was one of the founders of the Brotherhood of Russian Truth, an anti-communist organization with an underground network in Russia. In exile, Krasnov wrote memoirs and several novels. His famous trilogy From Double Eagle To the Red Flag, in addition to the main plot, with its hero, General Sablin, has several sub-plots which encompass many places, events, and personages. It presents a vast panorama of the Revolution and the Civil War throughout the country. Events are revealed through the fates of many characters, who, in turn, give their own interpretations of the events. Even the revolutionaries have an opportunity to express their views, although, in general, their political expositions seem to be the weakest parts of the novel. The ideology of the book is thus presented polyphonically. The author, although he tends to align himself with his conservative characters, offers no personal opinion of his own. All major themes, such as authority vs. anarchy, respect for human dignity vs. violence, creative work vs. destruction, as well as cruelty and terror, are treated in this polyphonic manner. Krasnov's novels were translated into English, German, French, Serbian and other European languages. During World War II, Krasnov continued his "German orientation" by seeking an alliance with Nazi Germany. He agreed to organize and head Cossack units out of White emigres and Soviet (mostly Cossack) prisoners of war, to be armed by the Nazis. The Nazis, in turn, expected Krasnov to follow their political line and keep to a separatist Cossack orientation. In November 1944, Krasnov refused the appeal of General Andrei Vlasov to join the latter's Russian Liberation Army. At the end of the war, Krasnov and his men voluntarily surrendered to British forces in Austria. All of them were promised upon surrender by Major Davis that they, as White Russian emigres, would not be repatriated to the Soviets. On May 28, 1945, Pyotr Krasnov was handed over to the Soviets by the British authorities during Operation Keelhaul. He was sentenced to death by the Military Collegium of the Supreme Court of the USSR, together with General Andrei Shkuro, Timofey Domanov and Helmuth von Pannwitz. On January 17, 1947, he was hanged. On January 17, 2008, Victor Vodolatsky, Ataman of the Don Cossacks and a deputy of the United Russia party in the Russian Duma proposed the creation of a parliamentary working group for rehabilitation of Pyotr Krasnov. Krasnov is the grandfather of Miguel Krassnoff, an Austrian-born Chilean citizen convicted of numerous crimes against humanity allegedly committed during the dictatorship of Augusto Pinochet. The latter has many supporters who deny these crimes. Among others charges, Miguel Krassnoff was convicted for the "permanent kidnapping" of former communist militants, for whom there is now proof that they are dead. From Double Eagle To Red Flag. . New York, Duffield and Company, 1926. 2 vols. The Unforgiven. New York, Duffield and Company, 1928. 444 p.
The Amazon of the Desert. Trans. by Olga Vitali and Vera Brooke. New York, Duffield, 1929. 272 p.
Napoleon And The Cossacks. 1931. Largo: A Novel. New York, Duffield and Green, 1932. 599 p.
This page is based on the Wikipedia article Pyotr Krasnov; it is used under the Creative Commons Attribution-ShareAlike 3.0 Unported License (CC-BY-SA). You may redistribute it, verbatim or modified, providing that you comply with the terms of the CC-BY-SA.